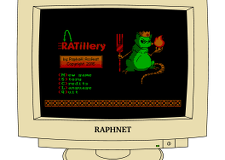 RATillery is a simple artillery game inspired by gorillas, but written to run even on early PCs. 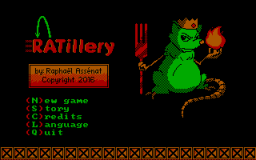 In RATillery, two fireball-throwing rats fight atop stacks of crates in a warehouse. Playable alone against the computer. CGA-compatible graphics adaptor or Tandy video adaptor. 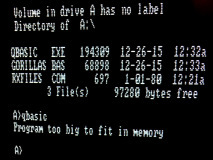 Memory: 128 Kb (CGA version), 256 Kb (Tandy version). 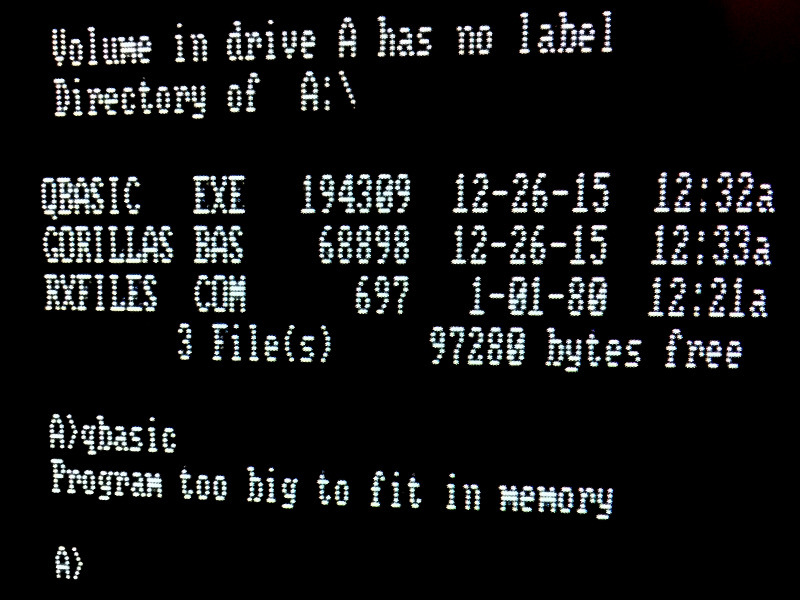 Operating system: DOS is optional (PC booter version also available). 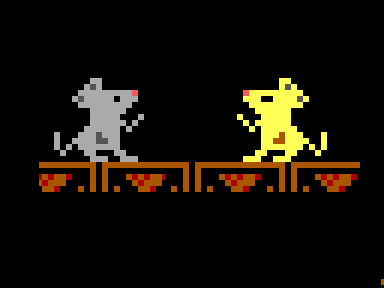 If a picture is worth a thousand words, how many words is the adjacent animated GIF worth? 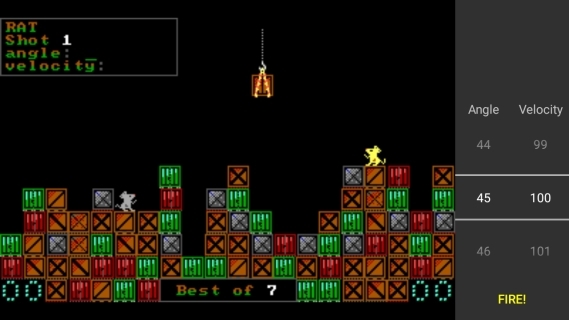 The players, in turn, must enter the angle (0 to 90 degrees) and velocity (0 to 255) for their shot, aiming to destroy their opponent. If the shot exits the screen sides, nothing happens. 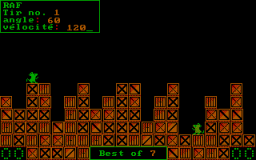 The fireball is of course blocked by the crates, but these can be destroyed. 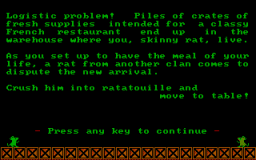 The location of the rats and crate disposition are random and change each time a player is hit. 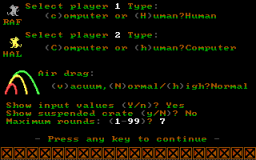 The winner is the first player to hit his opponent a given number of turns, configurable from 1 to 99. Three air resistance settings are available: Vacuum (no resistance), normal and high. There is enough difference between those choice to confuse a player used to playing at a different setting. A good way to restore the balance between players of different experience. If enabled, a suspended crate will appear in a random location within the game screen, more often than not blocking your perfect shot trajectory! 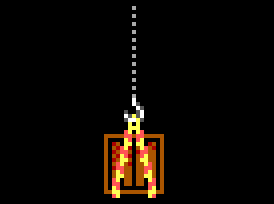 The hook and chain cannot be destroyed, but the chain does not always stop the fireball. 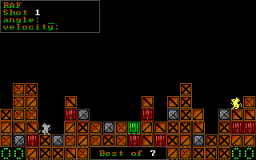 You'll have to be lucky, use a high altitude shot or slowly burn your way through the crates. Your shot barely misses your opponent, then what does he do next? He uses the same angle he saw you input but slightly adjusts the velocity and gets you. 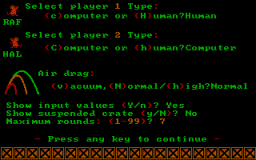 To avoid helping your enemy, the input values can be concealed, password style. If you're playing against the computer, this actually keeps you from looking at your opponent's values. 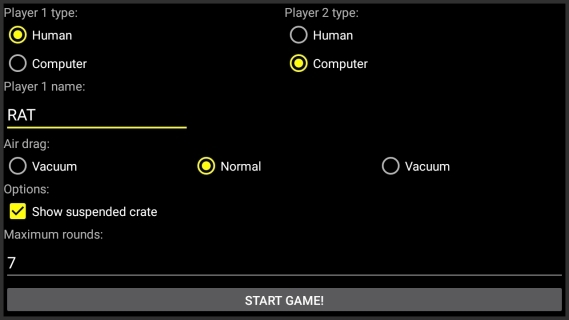 For the computer, it does not make any difference (it never cheats). 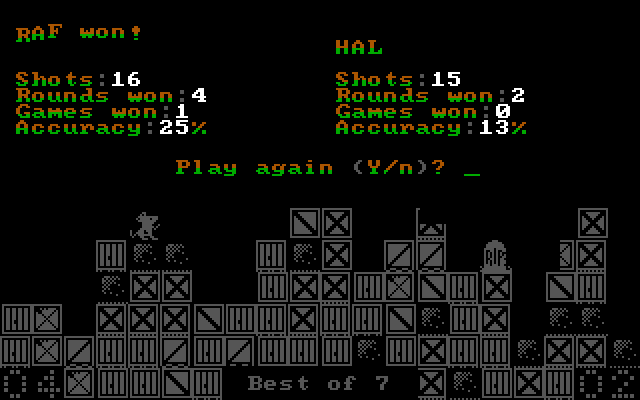 All shots and results are taken into account and when the game ends, simple stats are shown. Remember: Aim for the top by aiming at your opponent. 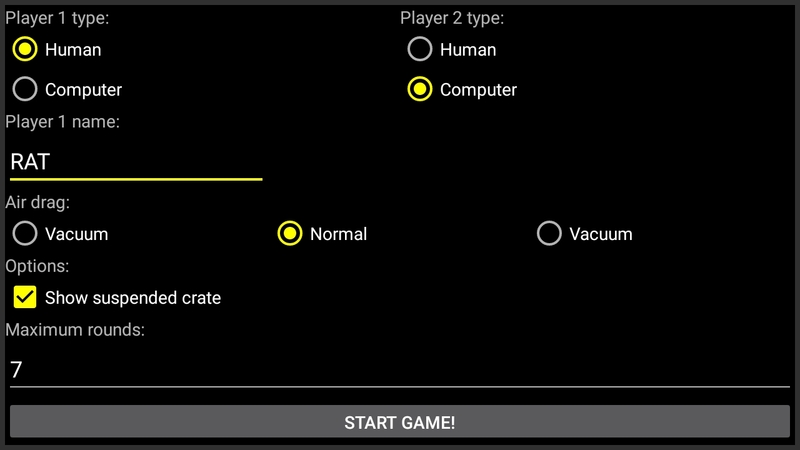 The game lets you play the computer against itself. 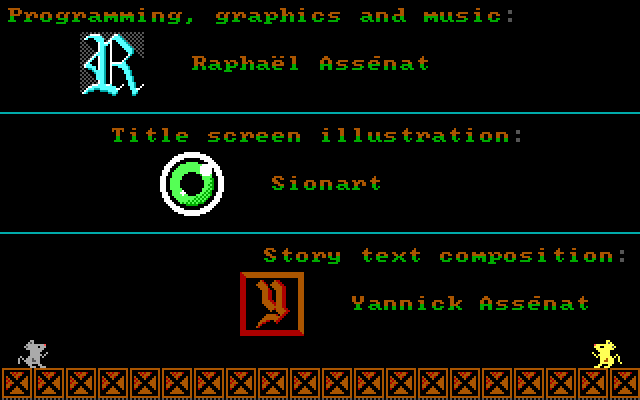 I used this to test that the pseudo-AI would always, eventually, find a winning shot. This was necessary since the AI does not compute a perfect one-shot win. Instead, it tries to find it by trial and error. 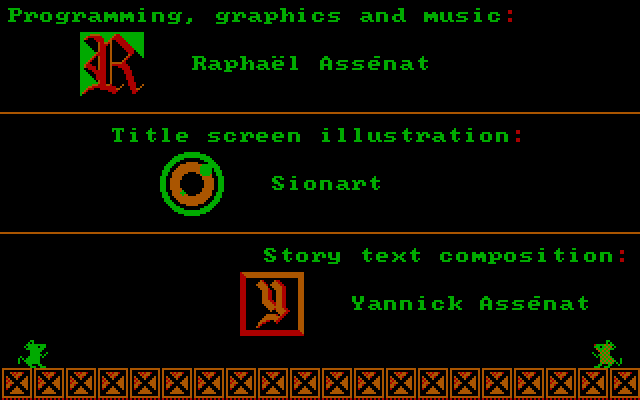 Here are screenshots of the CGA version, which is also compatible with EGA and VGA cards. 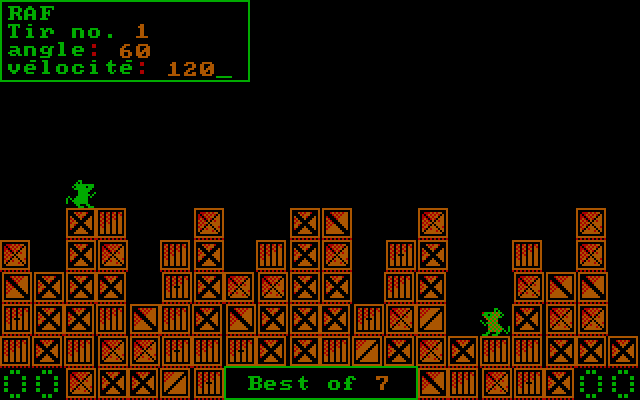 I chose to use the Green-Red-Brown-Black palette since it works well to display wooden crates. 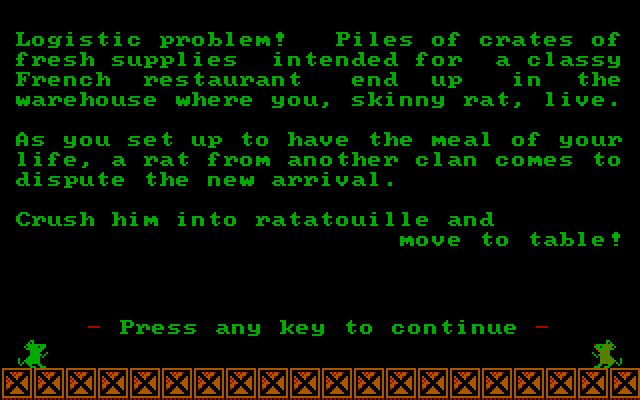 For the rats however, let's just say the their green color is a side effect of their fireball throwing ability? 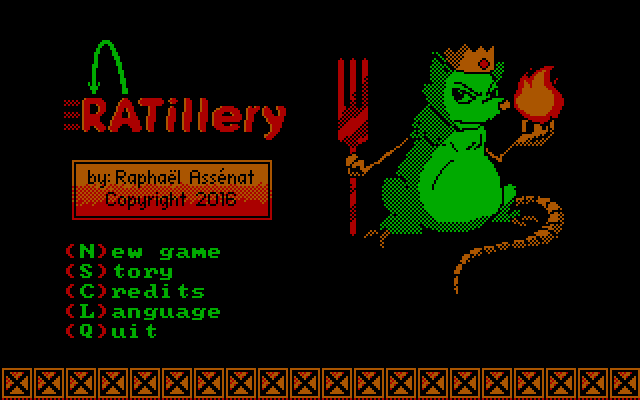 And now here is the 16 color Tandy version. 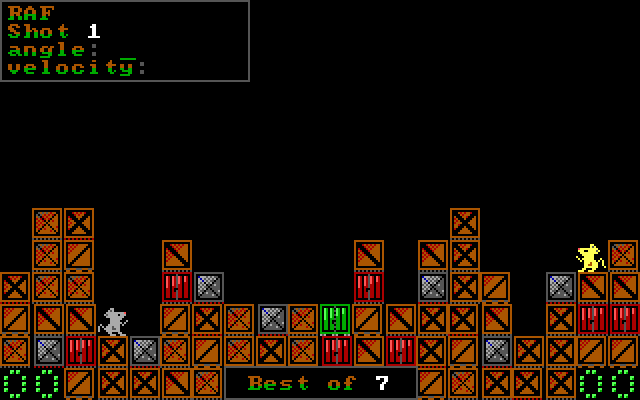 There are a few extra crate types (supposed to be containers) and I tried giving a camouflage theme to the font. Unfortunately this version will not work on CGA, EGA and VGA cards. 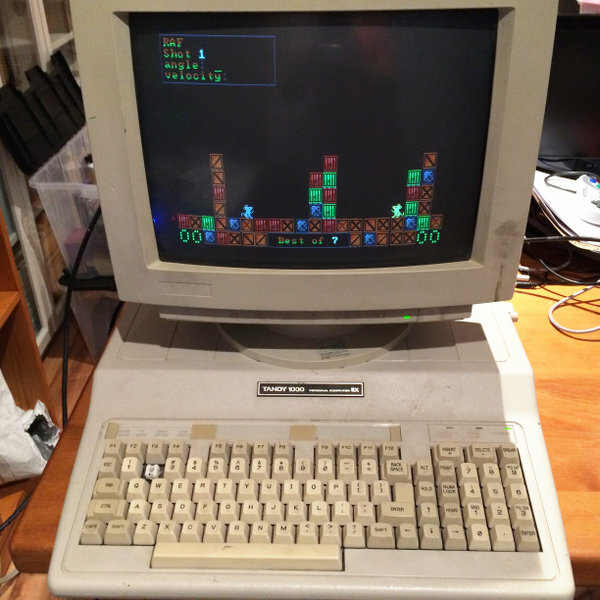 You will need a real Tandy (or PCjr?) 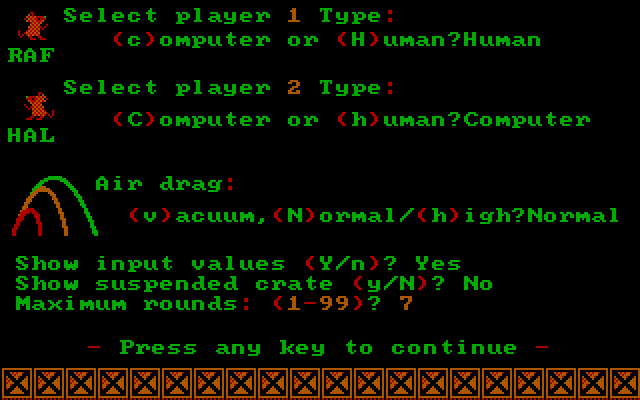 computer if you want to play this slightly more colorful version of the game. 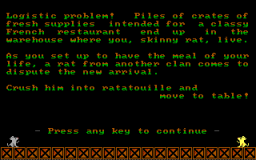 Under DOSBox, use the machine=tandy configuration option. 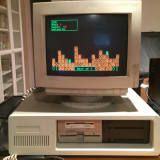 Here are a few pictures of the game running on a Tandy 1000 EX and on an IBM 5160 (XT) clone with CGA card. 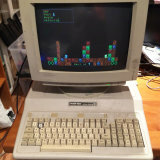 I would be very happy to receive pictures of the game running on other old PCs to add them here. 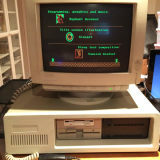 Especially, I would like to know if the game works on PCjr and on an IBM 5150, the first IBM PC! A few weeks later, the game was working. 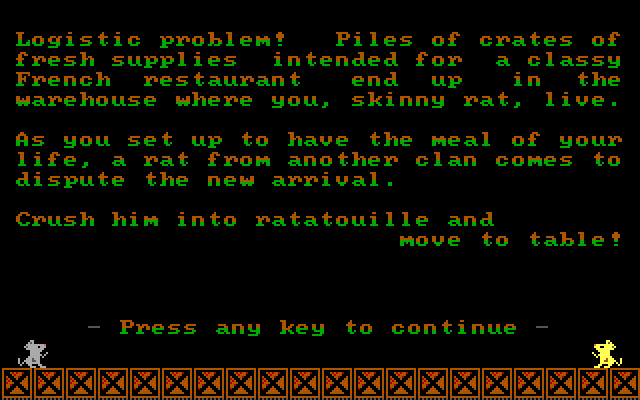 From then, for several months on and off, I made tweaks and improvements such as adding a second language, adding support for the 16 color Tandy-specific video mode (for my Tandy 1000 EX! ), creating a bootloader for the PC booter release... Until August 2016 when I deemed the result acceptable. Development was made under Linux. 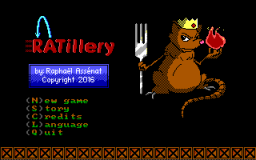 The game is coded entirely in assembler (using nasm), and the related tools (image conversion, music compression, etc) are all coded in C. During development, I used DOSBox to test (which I even ran directly from my Makefile). I composed the music using MONOTONE. 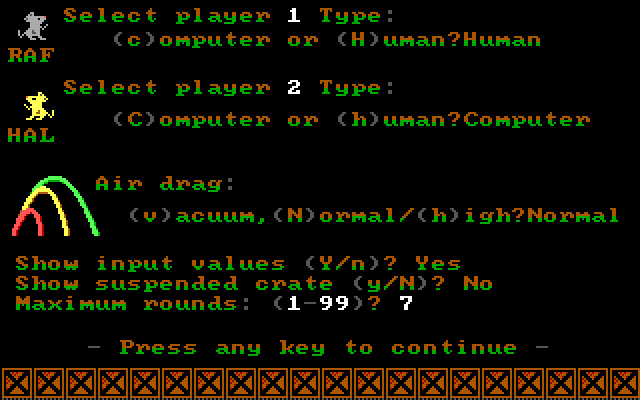 I use the Disk Writer function which saves the values one must write to the registers controlling the PC speaker to reproduce the music. 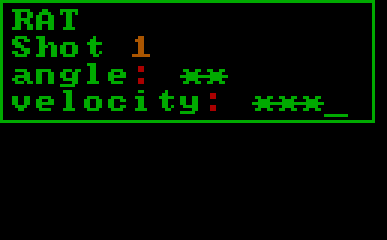 This is very repetitive data which wastes space, so I compress the data using a simple RLE algorithm before embedding it in the game executable. 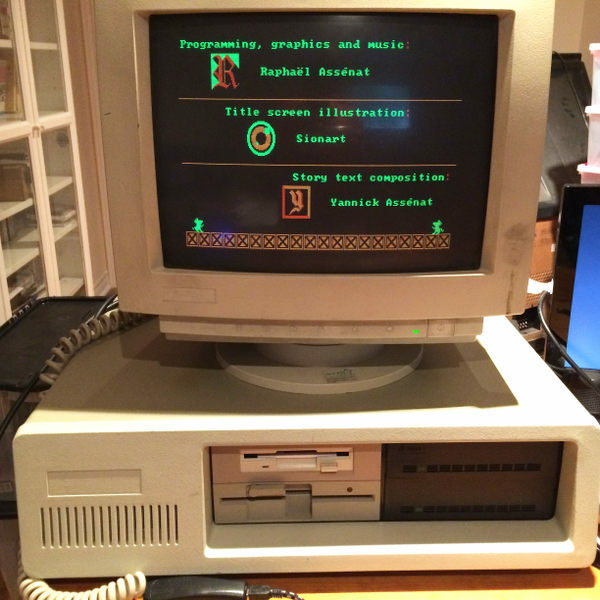 Besides DOSBox, I used the Tandy 1000 EX that sparked the project, and IBM XT clone with a CGA card, a generic Pentium 133 and VMware. 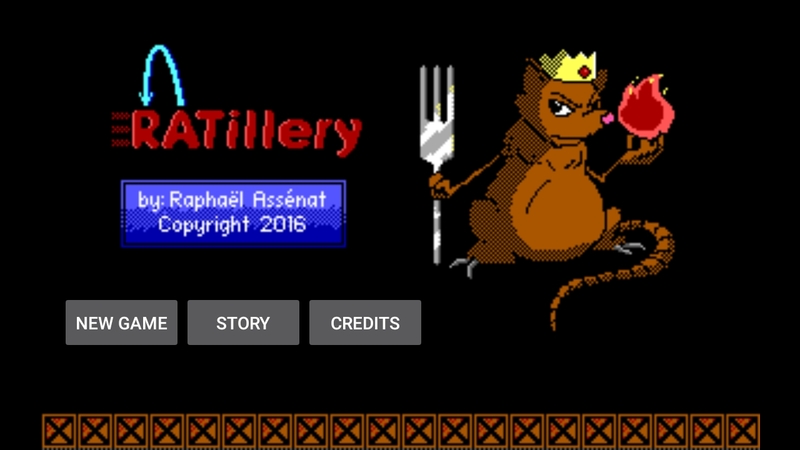 In 2018 I set myself a challenge to make an Android version, but without rewriting the game. 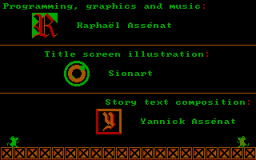 To achieve this, I created a simple PC emulator able to load the original .COM executable and patch it with basic usability modifications for touch screen input. Creating the emulator was a very interesting experience which I tell about on a dedicated page. The Android version, still in development, is available in the play store. Try it now!